A jumbo disruption mitigation pellet (16 mm) hits the deflecting plate and shatters. Scientists are working on plate orientation to optimize the spatial distribution of debris. The fuels used in ITER will be processed in a closed cycle. The fusion reaction in the ITER Tokamak will be powered with deuterium and tritium, two isotopes of hydrogen. ITER will be the first fusion machine fully designed for deuterium-tritium operation. Commissioning will happen in three phases: hydrogen operation, followed by deuterium operation, and finally full deuterium-tritium operation. As a first step to starting the fusion reaction, all air and any impurities must be evacuated from the vacuum vessel. The powerful magnets that will help to confine and control the plasma are then turned on and the low-density gaseous fuel is introduced into the vacuum vessel by a gas injection system. 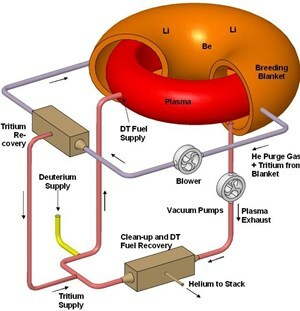 Once the fuel has been introduced into the vacuum chamber, an electrical current is applied to the system which causes the gas to break down electrically, become ionized, and form a plasma. Powerful pumps were developed for ITER to inject the gaseous fusion fuels into the vacuum chamber. With a throughput of 200 Pa m³/sec on average and 400 Pa m³/sec at peak, the power of the injection systems developed for ITER will be almost one order higher than that of any existing tokamak. The ''closed DT loop'' fuelling cycle of ITER. Stored deuterium and tritium are introduced into the vacuum chamber where only a small percentage of the fuel is consumed. 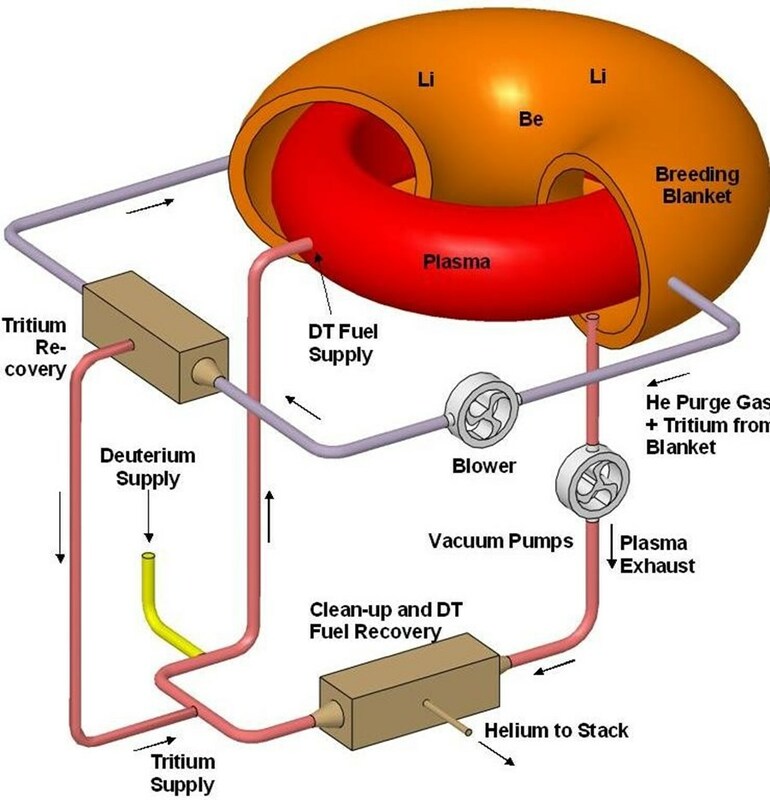 The plasma exhaust is removed and processed through an isotope separation system that extracts out the fusion fuels for reinjection into the fuelling cycle. A second fuelling system, a pellet injector, will also be used at ITER. The pellet injector is mainly a highly-efficient ice maker. 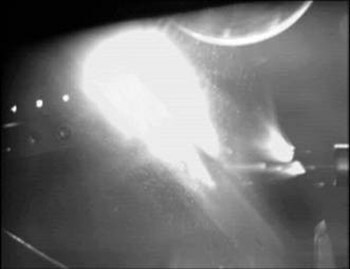 An extruder punches out several millimeter-sized deuterium-tritium ice pellets that are propelled by a gas gun up to 3,600 km/h—fast and cold enough to penetrate deep into the plasma core. The frozen pellets are injected through a guide tube located in the inner wall of the vacuum vessel and another guide tube for outer wall injection. Pellet injection is the principal tool used to control plasma density and is also efficient in controlling Edge Localized Modes, or ELMs. These energetic bursts escape the magnetic field surrounding the plasma and causes loss of energy. By shooting the frozen fuel pellets where they are needed, pellet injection has been shown to be effective in ELM management. Special technology is being developed to allow these pellets to fly along curved trajectories, thereby attaining specific zones within the plasmas where ELMs are particularly disruptive. Less than 1g of fusion fuel is present in the vacuum vessel at any one moment. The divertor located at the bottom of the vacuum vessel permits the recycling of any fuel that is not consumed: unburned fuel flows to the divertor, is pumped out and separated from helium produced during the fusion reaction, mixed with fresh tritium and deuterium, and reinjected into the vacuum chamber.